Here’s a few of my fave pics from that evening. The OMG moment… And celebrating with my gorgeous family afterwards. And here’s a few other snaps from the evening (courtesy of Cat Sparks, whose full album of Swancon & the Aurealis Awards is on Flickr). Other fave moments from the evening included getting to see Sam Murray pick up her Aurealis for Best Science Fiction Short Story; watching Sam deliver Tim Napper’s speech for his win for Best Horror Short Story; and having the honour of accepting Kaaron Warren’s award on her behalf for Best Horror Novel. (If you’re interested, the #fauxcon hashtag chronicles my Canberra crowd’s celebration of the evening from back home. Made me wish I could be in two places at once.) 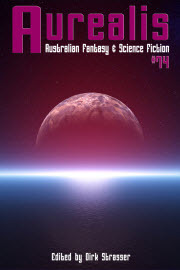 All the winners are up on the Aurealis website. And here’s a few pics from the day I spent at Swancon in Perth (again, thank you Cat Sparks!). I caught a GOH talk with Traci Harding, attended *two* book launches, a panel debating various thorny issues that arise in SFF fandom and I got a short excursion to a local bookstore to catch sight of Cat’s new novel Lotus Blue in the wild. Plus I spent some serious quality time with my tribe in the restaurant and the bar. I rounded it all out with a delicious dinner with friends under a spectacular, purple, fairy-lit tree. As always, the very best thing about going to a con was the people. *sniff* I love youse all. Huge congrats on your Aurealis win, Leife! I’m just catching up on all the news after our USA jaunt. So happy for you and all the award winners! Thanks Georgina! 🙂 And your trip looked like wonderful fun. I have been totally living vicariously through your pictures! Hope you are not too jetlaggy.